and calcium is essential for all living organisms. goes way back, before over seven thousand years BCE. to get quicklime, calcium oxide. Humphry Davy decomposed it into oxygen and a metal. Calcium carbonate for coral reefs. and Notre Dame in Paris. and the Pantheon dome in Rome. Calcium in Tums and mineral supplements. Bigfoot prints cast with plaster of Paris. 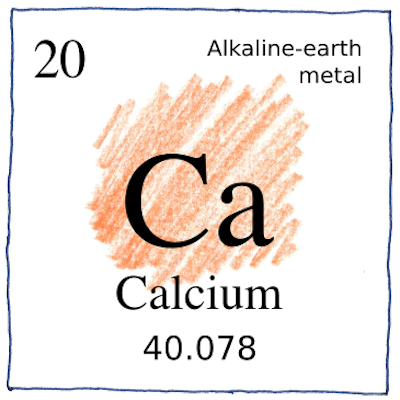 your body is full of metal, mainly calcium. It’s in your blood, teeth, and bones. where, to function, nerves and muscles need them. The first three elements that Davy discovered using electrolysis (potassium, sodium, and calcium) are too reactive to occur as metals in nature but are essential nutrients for all animals.